Rarely, lamivudine has caused a severe (sometimes fatal) liver and blood problem (lactic acidosis). Tell your doctor right away if you develop symptoms of liver problems (persistent nausea, stomach/abdominal pain, dark urine, yellowing eyes/skin) or lactic acidosis (rapid breathing, drowsiness, muscle aches). If you have hepatitis B infection along with HIV, your hepatitis symptoms may get worse or become very serious if you stop taking lamivudine. Talk with your doctor before stopping this medication. Your doctor will perform liver function tests for several months after you stop lamivudine. Tell your doctor right away if you develop symptoms of worsening liver problems. Different brands of this drug have different amounts of drug. Do not switch brands of this medication without first checking with your doctor. If you have HIV infection (with or without hepatitis B infection), you should be taking the higher-strength dosage. Consult your doctor or pharmacist. Who should not take Lamivudine Solution? This drug is used with other HIV medications to help control HIV infection. It helps to decrease the amount of HIV in your body so your immune system can work better. This lowers your chance of getting HIV complications (such as new infections, cancer) and improves your quality of life. 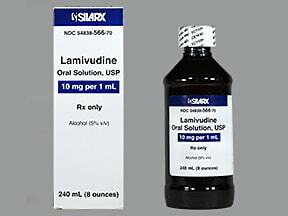 Lamivudine belongs to a class of drugs known as nucleoside reverse transcriptase inhibitors-NRTI. Lamivudine is not a cure for HIV infection. To decrease your risk of spreading HIV disease to others, do all of the following: (1) continue to take all HIV medications exactly as prescribed by your doctor, (2) always use an effective barrier method (latex or polyurethane condoms/dental dams) during all sexual activity, and (3) do not share personal items (such as needles/syringes, toothbrushes, and razors) that may have contacted blood or other body fluids. Consult your doctor or pharmacist for more details. Read the Patient Information Leaflet provided by your pharmacist before you start taking lamivudine and each time you get a refill. If you have any questions, ask your doctor or pharmacist. Take this medication by mouth with or without food, usually once or twice daily or as directed by your doctor. Carefully measure the dose using a special measuring device/spoon. Do not use a household spoon because you may not get the correct dose. What conditions does Lamivudine Solution treat? Tell your doctor right away if any of these unlikely but serious side effects occur: mental/mood changes (such as depression), stomach/back pain with nausea (pancreatitis). Tell your doctor right away if any of these rare but very serious side effects occur: easy bleeding/bruising, signs of anemia (unusual tiredness, rapid heartbeat, pale/bluish skin). 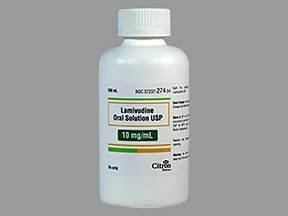 List Lamivudine Solution side effects by likelihood and severity. Before taking lamivudine, tell your doctor or pharmacist if you are allergic to it; or if you have any other allergies. This product may contain inactive ingredients, which can cause allergic reactions or other problems. Talk to your pharmacist for more details. This product may contain sugar. Caution is advised if you have diabetes or any other condition that requires you to limit sugar in your diet. Ask your doctor or pharmacist about using this product safely. Caution is advised when using this drug in children because they may be more sensitive to the effects of the drug, especially the increased risk of pancreatitis. Lamivudine passes into breast milk. Because breast milk can transmit HIV, do not breast-feed. What should I know regarding pregnancy, nursing and administering Lamivudine Solution to children or the elderly? Emtricitabine is similar to lamivudine and should not be taken with this medication. Check the labels on all your HIV medicines because they may contain the same ingredients as found in this product. Taking too much of these drugs will not necessarily improve your condition, and may cause more side effects. Does Lamivudine Solution interact with other medications? Store the US product with the lid tightly closed at room temperature at 77 degrees F (25 degrees C) away from light and moisture. Do not store in the bathroom. Store the Canadian product with the lid tightly closed at 36-77 degrees F (2-25 degrees C) away from light and moisture. Do not store in the bathroom. Are you taking Lamivudine Solution? Are you considering switching to Lamivudine Solution? How long have you been taking Lamivudine Solution?